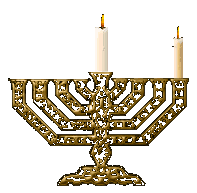 There stands a Chanukiah, proud and tall. With faith and hope and spiritual light. But why do we celebrate year after year? With a crazy king, as bad as Pharoah. But alas, he had some very mean streaks. To all the Jews he was oh so cruel. "Gods are made of stone," he'd say. And practicing their rituals in the Jewish way. Why? Because the king was off his head. Could it be worse? Isn't that enough? How could he do such terrible stuff? As enemies destroyed their holy places. Can you believe it? It was such a disgrace! All that they could touch and feel. Except in their hearts where G-d did stay. And bowed down before the king. "Whoever is for G-d, let him come to me,"
Or else they'd destroy the whole Jewish race. He fought for freedom till his dying day. The Maccabbees were his famous troop. They climbed a mountain and hid in a cave. Fought for their people - never turning their backs. And were joined by more Jews with similar plights. And left the kingdom in all their hordes. But wait! Not so fast...it was not all good news. Inside the temple, oh my...what a fright! Jewish eyes burned with tears at the sight. Could it be restored, or was it too late? At last, they thought, we are done. But there was no oil with which to burn bright. With some oil in it, lying on the ground. Making sure not to spill even a drop. To make olive oil, it took eight whole days. 'Twas time for another miracle to come. And the temple was restored by the light of its rays. So we light Chanukiot in homes everywhere.